Lian and Figg are still recovering from events that almost destroyed their lives, but when a good friend comes to them with a serious problem, they can't turn him away. 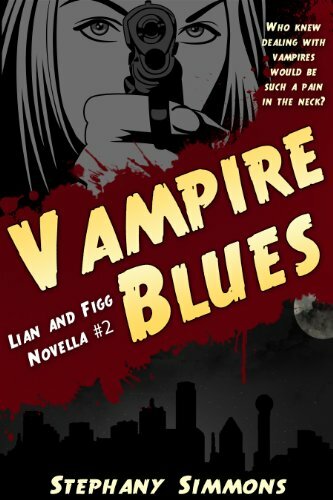 Soon, Lian and Figg are neck-deep in local vampire politics and framed for a massacre they had little to do with. On top of that, the local werewolf pack is sniffing around, looking for favors. 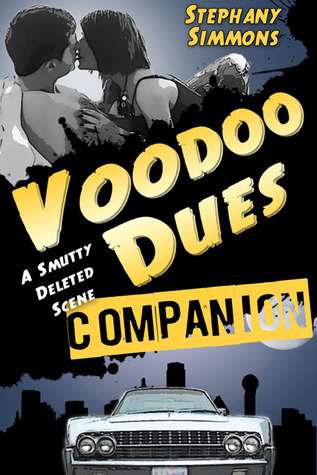 I was happy to see this sequel to Voodoo Dues, (review here), pop up. I had been eagerly waiting for it. I enjoyed Voodoo Dues but, as Stephany is a new writer, I was curious to see if she could keep it up. I am ecstatic to say YES SHE CAN. The action comes fast and steady in Vampire Blues. The characters we loved in Voodoo Dues are back and just as quirky as ever. Ms Simmons has brought a gay ghost, vampires and werewolves into the story. Oh my! Carl Tharpe, necromancer, former cross-dressing psychic and as of late, waiter, climbed out of the passenger side, unfolding his massive frame, even the SUV was too small for him. “Do you think they’re dating?” Figg asked me. “Weird,” we said at the same time. “Would you consider that a ménage à trios?” Figg asked. Carl had a constant spirit companion, a psychic ghost of a gay man who’d perished from a drug overdose in the late 1970s. The door chimed and John walked in, wearing a pair of sweat pants that I’d forgotten I had and an oversized X-men t-shirt that Figg liked to sleep in. “Figg will kill you if you mess that shirt up,” I said. She’d told me so many times that it was old-school and that she’d never find another one like it. "Boyd is gay.” I grabbed a bottle of scotch and two glasses, walking over to join John. “If I didn’t need a drink before, I do now.” He took one of the glasses from me; I opened the bottle and poured. “What?” I sat down across the table from him. It was exactly what I was thinking. I started to ask him if he could read my mind, but thought better of it. As you can see Stephany has a great sense of humor that shines throughout the book. She is also adept at writing action and romance, (clean), both of which are a big part of the book. The Lian and Figg series are not your usual paranormal books. Nobody is guaranteed to look perfect - not even the vampires who normally are. One gets the feeling that anything is up for grabs in the humor department and none of it appears to be truly mean spirited. Stephany writes of all types of paranormal so one never knows just who or what is going to be included in each book. I love this. It reminds me of Cracker Jacks - a surprise in every book. My one regret with this book is that it ended and now I must wait for the next installment. I hate waiting. Write more Stephany. Sleep is overrated. Haha. Hi Everyone! Sorry but I had some personal issues going on and ended up away from the site. I have missed visiting so many of you! I am excited to be back and will be stopping by to catch up with what you are all doing and reading! Now on to my first review of the New Year! The trial had everything an ambitious prosecuting attorney could want: a solid case against a known crimelord and a seductively beautiful witness with a steamy past - ingredients guaranteed to pack a courtroom." From its first line, Dangerous Lies entices. Alternately raw, romantic, funny, and terrifying, this racy new thriller has two unforgettable protagonists. Tina Davis is the former mob mistress who inexplicably risks her life. Jake Stern, is the prosecuting attorney who hides a crippling fear behind a handsome stoic mask. Repelled by her past and obsessed with her presence, it's Jake's job to keep Tina alive. Lisa sent me this book awhile back. Unfortunately, most of you know how it goes with TBR listings. I wish I could have gotten to it sooner. I found this book a thrilling read. I admit, I do love the "mob" stories. I grew up in Chicago, (Al Capone, Tony Lombardo, Bugs Moran, Sam Giancana among others). I grew up hearing of stories of the mob, reading of them in the local papers and seeing them on the local news. Lisa wrote a book that reminded me of those stories. I thoroughly enjoyed this book. I was so into the book that I had a hard time taking breaks. When I needed to do something or was interrupted by that thing called life, I was annoyed. I found myself falling asleep with my Kindle in my hands because the hour was so late, only to wake up after an hour or so of sleep to read a little more. I was a grumpy camper in much need of solid sleep when I finished this book. Lisa had sent me a tweet with this message attached: Warning: expect the unexpected. She didn't lie. The book takes many turns. Even though I did figure it out she still managed to get the unexpected in. I was interrupted right at that part and nearly had a heart attack. I commented on it on Good Reads. I rushed through what was needed and returned to finish the book. I loved Tina. I was rooting for her almost from the start. She triumphed over a hard life. It was hard to end the book and say goodbye. Jake had me then lost me. I know this man. I have met him a few times with different names. Rose I often wanted to slap. Then I started wondering what made her the way she was. Perhaps someday Lisa will satisfy that curiosity. They are a few of many characters who will stay with you. I don't want to spoil the book by saying more but Lisa does play your emotions like Eric Clapton plays guitar. I was amazed by how compelling a read this book was. I have a hard time thinking of this as being Lisa's first book. She writes in a more experienced way. 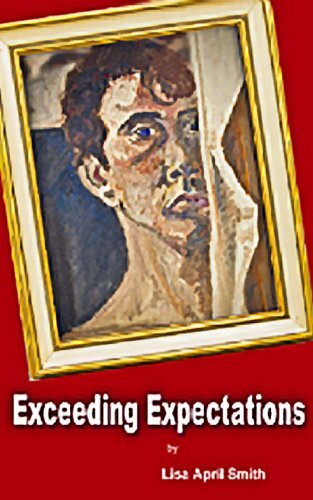 Recently she released Exceeding Expectations. I found the title ironic since I feel she did that with Dangerous Lies. I am looking forward to reading this one. Lisa is a truly talented storyteller. She really is an open and friendly author. 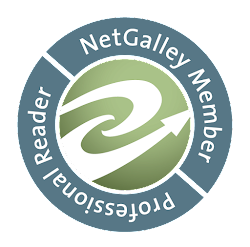 Check her out, especially if you like legal thrillers. Every month she has a giveaway of one of her books on her website. Be sure to check that out. I am sure you will like her! I know she would be thrilled to hear from you.